There have been some extremely interesting grocery challenges going around on the internet lately. I love reading what others do and how they experiment. For instance, Terri, at The Blue House Journal, did a challenge where she bought $20 worth of groceries and cooked with them for a week, on certain days, sometimes skipping a day here and there, but managing to keep within her budget for an entire 7 days. Then, she did another slightly different challenge. Jane, at Hope and Thrift, bought $20 worth of groceries and ONLY ate from them for 7 days in a row, without skipping any days in-between. Brandy, at The Prudent Homemaker, went for the entire month of January without buying any groceries, and ate entirely from her stockpile. She used her menus that she has developed using stored food, for this purpose, and has these menus listed on her website. So, of course, I wanted to join in on the fun, but knew none of these options would be exactly right for my family. I have given quite a bit of thought to what would work for us. I want to use up things I already have. I have a huge pantry full of ingredients, home-canned food and frozen food that is getting older each day since I did not preserve last summer, and space needs to be made for fresh garden produce this coming summer. I have quite a bit of meat as well. This is my main motivation for this challenge. I don’t want my family to feel deprived. Some of my kids suffered greatly when they were little, due to lack of food or whatever, and the “game” is not fun for them, if I don’t be sensitive to their needs. In fact, I may not even tell some of them I’m doing it. No need for anxiety here. I want to eat healthy, including lots of fruits and vegetables and staying lo-carb for myself. It also needs to taste good. I want meals to stay joyful for the most part, and a time when we can focus on each other, and not be wondering “what is it?” as we watch a few beans swim in a mystery broth with no flavor. So, I am glad I have a lot of spices, etc. to perk things up with. I won’t be able to please everyone all the time, but plan to please all of us part of the time, as usual. It needs to be gluten-free. I cannot tolerate any gluten at all, and so don’t even have regular flour in the house as I get sick when they let the flour puff out onto things and it gets into my food. After one child cooked a few years back, and I was very sick for 3 days, I threw away the wheat flour. I do, however, buy wheat bread, etc., and have trained the family to not leave crumbs around that would cross contaminate my food. I want to be able to take the kids (mine and nieces and nephew) for an ice cream, Coke, etc. on occasion, if I am in the mood. I started this challenge last Tuesday. I will probably go for 1 month, so through the 3rd week of March, but I’ll see how it goes–I may go longer. This past week, I made a good start. I made a gallon can of diced tomatoes into marinara sauce and chili. I made shell pasta (like lasagna) with meatballs for our family dinner Sunday and Rob packed the leftovers for his lunch today. 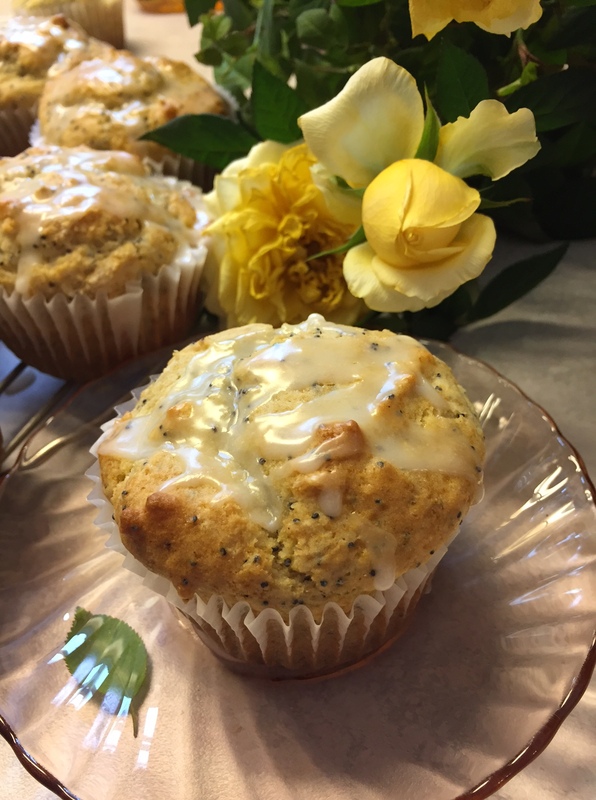 I used more poppy seeds in the muffins. I have a bulk bag that is almost gone now. The poppy seeds are getting old and need to go. I boiled a frozen mystery bag of meat. It ended up being a turkey drumstick and thigh and a few bits. I made soup for dinner last night and will grind the remainder of meat bits in the food processor with some relish to make sandwich filling. I made chocolate chip cookies and used a small handful of pecans I found in them. In the last week, we have purchased some 1/2 and 1/2. That’s all we’ve needed so far. I feel like we are off to a great start. If you are doing any kind of grocery challenge, feel free to leave a link about it in the comment section so we can all read about it! Or, just tell us about it. It’s always encouraging to hear about what others are doing in the fight to make the best of our resources in a joyful, happy way. What a pretty glass in the first picture! Ever since we have been empty nesters I sort of feel like we are doing a use it up challenge every day. With a household of two it is hard to doing any stocking up with out always feeling like I am in use it up mode. I have really reduced how much I keep on hand in the last year but I would love to hear any tips from other two person households on how you manage. I do not want to go to buying as needed since I feel we need to keep a stockpile on hand but am tired of knowing that the expiration dates are stalking me all of the time. Thank you! I have that part figured out as I mostly freeze extras and try to cook only enough for the meal on most nights. It is the question of how much to keep on hand and not be short in case of an emergency that is where I cannot seem to find balance. I am doing better with it but still feel like we are constantly eating expired or near to expiring foods. Sometimes it does feel like a battle, doesn’t it? A war, really, against waste vs. buying low and eating high:) Like you, I am trying hard to find that balance now that our family is much smaller. Thank you. I thought it was pretty, too. 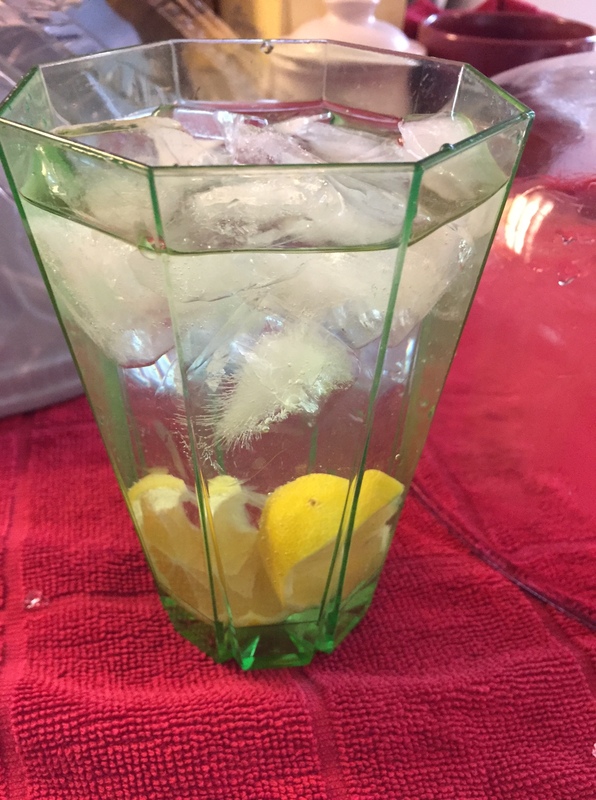 I used the remaining part of the lemon after I used some of the rind and juice for the muffins I made in ice water. It tasted good, too. I also am struggling with how much stockpile to keep–I want one–but there are only 2 kids most of the time anymore vs. the larger family we had at home for so long. It’s a balance, for sure, I’m still working on. Thank you, Vicky. I appreciate all your kind words. I want to do as you did in the aspect of buying the few things I need, but not ever going down to zero…..You did GREAT on your challenge. I know how it feels to get a big electric bill–we did, too, after that bad weather. I think it was the effects of keeping the camper warm and from freezing up. Hopefully, this month will be better, although I fear it won’t because our fireplace had an issue for about a week before we could get it fixed and we had to use the heater. It is great to have the Lord’s help, for sure. Without Him, we would be in much worse shape, I believe. I’m working through my pantry, in anticipation of this years bounty too, Becky. Actually, the $20 challenge where I didn’t use any of my pantry items costs more than what I have been spending lately, just buying lettuce and fruit. Making your girls feeling safe and secure is more important than any challenge. I’m hoping I can get most of my pantry cleared out so I can paint it this Summer before the new canning season begins. I was actually thinking about you when I wrote my list of “rules.” I knew you had a lot of stored food during your challenge. I get it when someone says “you can’t do that–it’s impossible”— you just had to do it. Overall, your challenge proved that a person can eat so much more variety and volume if they grow and store food, then if they can’t, among many other things. Painting the pantry sounds refreshing and pretty. You are quite inspiring! We are moving in two weeks so I have been trying to eat down the freezer and pantry. Tonight is smorgasborg, as I pulled a few leftovers out of the freezer! Good luck on your challenge. Love your blog as well as The Prudent Homemaker, I will need to check out the other one’s you mentioned in your post as well. I enjoy finding new ideas to use. Thank you, Cheryl. Last year, when we were moving, it was all about sorting, cleaning, packing, using it up. Now, I’m trying to find things, figure out how much I really need of everything, and fill the cupboards and freezer with fresh produce. It’s my kind of fun! Glad you joined in. I will join your challenge also but I haven’t set all my goals yet. Since the boys have all left and there are only two of us here, I am having trouble adjusting to just cooking for me and my husband. This week I started cleaning out my pantry (in the basement) and noticed one of the boxes on a high shelf would not shove all the way back against the wall. I climbed up there and found boxes of velveeta cheese that had fallen back behind there. They expired in 2014!!!! YIKES! I threw them AWAY! 1. My first goal will be to continue to clean out behind everything. 2. Next I will use the computer inventory program emailed to me by “Thrifty Mom in Boise. blogspot.com. (She will email to anyone who asks) and start a running list of what I have in storage. 3. I have canning jars stuck in closets all over the house and need to get them moved to the basement so I can see just what I have. I stored them in dark closets because Bill worked in the basement and the light was always on. Now his office is upstairs and the basement stays dark and cool. Time to switch. 4. Decide what I need to use up first and make a plan. This is not a one month project. It is a year’s project. No wonder I have been procrastinating. OK. I am starting NOW. I am logging off and getting up and getting busy! Jeannie, your plans sound great! I can’t wait to see pictures of your clean, tidy shelves. And your menu plan that does not include Velveeta:) I know I moved too many canning jars here to the new place, but didn’t want to get rid of any until after this summer, since so many are emptied. I’m going to decide after I do my canning. It’s great to see what you have. Pictures of CLEAN, TIDY SHELVES! NOT! A menu without velveeta is absolutely doable. That stuff smelled bad, I don’t ever want it again. I only buy it once a year for the traditional Thanksgiving vat of macaroni and cheese. Would love to hear more of how you go. Sounds like we r on the same wavelength, though i dont have a garden or even space for herbs on a bench. Im struggling on $100 a week, will need to be less per person soon with a new baby on the way! If I had to buy every single ingredient, I would really struggle, too, with $100 per week. I just have a lot of preserved food, both frozen and canned, and keep a large quantity of bulk food. I don’t know your circumstances, but I wonder if you could u-pick some fruit, or veggies this summer or watch for things on super sale and start preserving things. You might already have a stockpile, but if you don’t, I’d start in a small way and get the stockpile built by just buying 2 or 3 extra of anything that is on super sale, and go from there. Or, buy a huge bag of whatever you use a lot, say sugar or dry beans (whatever you actually use–it’s no bargain if you don’t eat it)–you can get a 25 lb. bag around here for under $15 for either. Then, the next month, buy another item. I store these things in empty tins, Tupperwares from garage sales, old ice cream buckets, etc. and stack in the garage. Thanks. Good ideas. I dont think australias climate needs preserving as we have fresh all year round, no snow! But i will look into it. Have very limited space in a unit but i do buy rice in bulk. Scared flour will go off in heat, everythings in tupperware only coz ive had horrors with pantry moths in the past. I havent found many staples on sale here in my part of the world, apart from rice, so i shop at multicultural stores mostly for spices. Might look a bit more closely for bulk items. Completely different to uk where i lived for a year when always found specials. Have started to find a few things starting to come ‘bulk’ (ie 1kg) in aldi now…might b able to ditch costcos soon. That’s great that you can get fresh things all year round. Of course, with things as they are with transportation all over the world, we can too, but the prices and quality are not great during the winter months and I can’t grow things in the dead of winter or get them for free from my sister’s farm. So, I rely on frozen and canned food for part of our meals and buy some fresh produce for others. One thing I can is green beans. We can eat at least 50 quarts a year–that’s only 1 per week. It’s great you can buy some things in bulk to bring down your costs. My funniest bulk purchase was one that my husband made a few years ago. I sent him for a large bag of white sugar. I thought 25 lbs would be sufficient as I was going into canning season. He came home with the sugar AND 50 lbs of white rice. 50. I was kind of horrified, it was so much! I asked him “WHAT WERE YOU THINKING?” He explained that the entire bag was only $22 and he couldn’t resist. We are still eating it, in fact we had some today. It is perfectly good, and the kids love it, and it’s basically free at this point. I’m a bit like you. I read several blogs on thrift and combine ideas from all the sources into something workable for me. To the lady now trying to manage a two person household – I’m in a similar situation. I’ve been divorced and on my own for five years now and feel like I’m just now getting a handle on managing my food/pantry/cooking. I went from a household of hubby/ adult son and several homestay young adults to just me. Usually 6 of us but up to 9 in the summer. What a learning curve! And, on top of that, the emotional roller coaster didn’t help. Bottom line – the Lord brought me through it all and I’ll give Him the praise here. My strategy was to be patient with myself. And in there somewhere, I also changed what I ate. And I had to find new garden space. When I moved, I had to donate all of my long term storage. So, two moves later when I ended up in this apartment, I was starting from scratch and a limited budget. In the beginning, I would buy 1 more then what I needed for a given recipe. As I had money that coincided with good sales, I’d stock up on staples. Don’t be discouraged. It takes time but it’s do-able if you just keep at it. Now, five years later, I mostly just buy items on sale and fresh veggies and milk. The way I cook changed. When I cook a meat like chicken parts or pork chops, I’ll cook enough for 3 dinners. That amount coincides with how my closest store tends to pack their meat. I’m cooking one night and having leftovers two nights. When I cook a casserole, I’ll cook half the recipe and even with that reduction, I’ll end up eating it for two nights and freezing one container for the future. I learned early on not to have too many meals in the freezer. For me that just meant more food to throw out due to freezer burn. I know stocking a freezer works for some people but it doesn’t work for me. Another learning curve. One of the things I did early on was to donate most of my big cooking pans, pots, rice cooker and crockpots. I bought new to me ones (mostly from the thrift) that were smaller. So, for example, I went from several of the largest crockpot made to one of the smallest. Having the proper sized pans, etc. has really helped me cook for just me. I’m glad you are feeling more settled now. I think any change is hard, and I know from experience that big changes, all at once can be overwhelming. I’m glad the Lord helped you come through and you are overcoming. I am the lady who is now trying to manage a two person household. All of these suggestions are great. I need all the help I can get. Getting smaller pans is really a good idea. I don’t have enough and keep using the bigger pots. Today I went to the grocery and spent $70, REALLY $70 FOR JUST TWO PEOPLE! What am I thinking? The refrigerator is full, my pantry is stuffed and the food is not disappearing like it used to do. This is harder than I thought it would be. Those are all great ideas! I even can jam in little jars for us, because only a few of our family are big jam eaters and the pints were molding before we could eat them. I also do freezer jam occasionally, in little cartons. I like your list of rules. Each family’s needs are different. I have had times where I shopped every 2 weeks, once a month, weekly, and sometimes shop a lot in May, and then don’t shop all summer, except for the small things. I love trying new ways of doing things and finding what works at the time! I hope the once-a-month shopping works for you. I did shop this way years ago when the children were little. It was just easier. Now I am doing it to try to make sure I use everything up rather than just keep adding and adding and…..
And adding and adding and adding……I hear you! There was a time when I cooked for 11, years and years ago. We had a couple of grandmas, etc., that I was cooking for at the time. I actually love cooking for a crowd, so it is a learning challenge to cook for less, even after all these years. Most of the time, I am only cooking for 4 anymore. Tonight, when I emptied the bowl of soup, at last, it felt really good to clear up that space in the fridge. It was really good soup, I’ll say, but I’ve had it 4 or 5 times this week. I did get rid of 2 entire freezers when we moved here, and then our extra fridge broke during the move, so that was another small one…..so there’s progress. I’ll be interested to see how much of your $50 you can save. I remember the days of feeding a family (5 kids at home and 2 adults and we seldom were without company crowded around the table too!). It’s been interesting to do these challenges with small amounts of money. The intent is to remind myself that I dont’ need a bigger budget but to be as wise as I can with whatever budget I have. Honestly the current challenge budget almost feels normal! Good luck! We are gaining on 2 weeks on this challenge, and we were both saying that it was hard to pass up bargains today. We each went to different grocery stores to grab a few items that we needed after almost 2 weeks of not shopping. I wanted the best prices on tortillas since we are having company this weekend (a large family, so we need lots), so sent him to Cash and Carry for a few items, while I went to a store 1 block away from home for a few more like celery, bagels for my nephew Jake, etc. Anyway, we are stocked up again now for the week ahead:) I still have a few dollars left from the first $50, so think that by next Monday, the end of week 2, I will probably average out around $20-$25 per week. We will see if anything comes up I’m not expecting. I agree! When Rob went to Cash and Carry, he had a terrible time sticking to the plan. There are so many good deals there, and of course, in large packages for the same price as a small one at the regular store! But, he was good, and only spent $16 on things I asked for. Bountiful basket today was indeed bountiful. I figured out what the lettace, celery, asparagrass and other things I would normally buy would cost at winco setting aside things as I went. The basket cost 17.50. When I had set aside 17.00 of winco price items there was still 10 pounds of red potatoes and 5 pounds of citrus left in the box. I like supporting the local growers and not paying the sales tax. Its a double happy win for me. There were things like mangoes and bosc pears that I would not normally splurge on so we will have some special meals. Stopped at the dollar store for frozen sausage, garden seeds and shampoo. Total expenditures for the week. 24.50. The best part was I was able to stay out of the grocery store. Stopped at the thrift store. Found a pepper grinder, a new refill for my sponge mop, 2 scarves and some paperback books for a total of 2.83. So with my instapot roasted chicken cooked and my box of fruits and veggies I am ready for another week of pantry challenge. Let the games begin! You did great! I remember my friend’s baskets and they were an excellent value, as well, and also challenged her with some unusual ingredients. It sounds like you’ve had a wonderful week saving money. Mine is going well, also. I have a small challenge going on as well. My husband is traveling for first 2 weeks in March so I am trying to eat out from our fridge and cupboard whatever he would not 😉 So far so good. I just had some pancakes for dinner. Yum! That’s a great way to clean out odds and ends! I’m sure you will be ready to see him back when he returns. My instapot really came to the rescue this week. The chicken I cooked after removing the breasts for later came out fall off tender. I boned it out giving the scraps to the dog and chickens just throwing away any big bones. The meat was used for chicken pot pie and chicken salad sandwiches. The cooled broth was skimmed of fat which was saved to start hash browns . the broth was used to cook homemade noodles for noodle bowls and rice for fried rice. I froze the breasts to have later. There’s still rice, noodles and pot pie to use so with the addition of veggies that bird gave us a lot of meals. Teresa, I’m still experimenting with my new Instant Pot. I haven’t used it this week, because I’ve been in too much of a hurry to think about anything except the crock pot. Ironic, isn’t it? Anyway, How long did you cook the chicken and on what setting to make that wonderful broth/bits? Becky. I use the poultry setting at 40 minutes with a natural release. I usually add just two cups of water an onion and some seasoned salt when I put it in. I normally take the boneless breast fillets off and save them for a stir fry or pounded into cutlets. Thank you. I am hoping to pull out a chicken and try it in the next few days. I also work for a school district and my summer checks are a bit larger than my usual ones because of no union dues and its not taxed. They also withhold a bit of money from my checks to pay over summer. Hopefully it works out the same for you guys. Well, that would be awesome!!!! Thanks of the encouraging words! That’s a great idea–a cookbook with pantry meals! Right now, we call it “playing the game” but I agree that it is so necessary to know how to pinch a penny for those times when we need to. Thank you for hosting the Art of Home-Making Mondays. I’ve only recently discovered it and enjoy reading many of the posts on it.